Gin Blanco, aka the assassin the Spider, might have finally killed her nemesis, Mab Monroe, but that doesn’t mean that it’s smooth sailing. Gin goes to Mab’s funeral to say her goodbyes and runs into some of Ashland’s most notorious underworld power players, including Jonah McAllister and Phillip Kincaid. McAllister wants her dead, and Kincaid has his own murky motives when it comes to the Spider, and Gin once again finds herself fighting for her life. Only this time, she might wind up in the cemetery right next to Mab. I have been hearing great things about Ms. Estep’s Elemental Assassin series for a while now. I’ve wanted to read it, but by the time I got around to it, the series was already four books in, and I just didn’t have the time to commit to reading four to five books. (Lame excuse, I know!). Anyhow, I’d been chatting with the wonderful Ms. Estep and asked her when would be a good time to “jump in” to her series. She suggested this novella, and I’m so thankful she did! 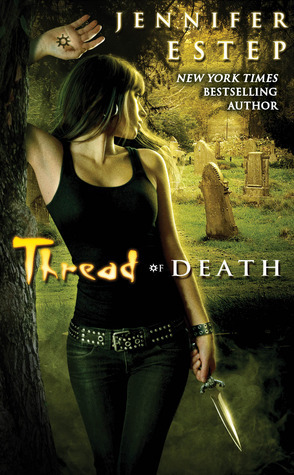 Thread of Death is a nice little story – a “day in the life” of Gin – that bridges the story arc ending in the past book with Mab’s death, and a new one starting in the upcoming By a Thread (February 28, 2012, Pocket Books). In this novella, we find Gin recovering from her battle with Fire Elemental, Mab. Gin is also an Elemental, able to manipulate Stone and Ice to her advantage (there are also Air Elementals). I’m still learning about Elementals, but I got a feel for what they can do in this story. The story takes place over the course of one day – the day of Mab’s funeral. It is also Gin’s first day out and about. Surrounding Gin is a close-knit group of friends and family, including her sister, Bria and her lover Owen. These friends are among the few that know Gin is actually the Spider. As Gin psyches herself up for leaving her home, the reader is given details about each of Gin’s friends. Ms. Estep provides in a sense, a tutorial of who’s who in Gin’s life. I quickly got a feel for who was important to Gin and why. I also learned where there were problems in this small group. At the funeral, Ms. Estep gives the reader more insight into the major players (i.e. crime bosses and thugs) in town, and I have a feeling she was setting the stage for what is to come. Gin is being strategically hunted by Mab’s long-time associate, Jonah McAllister, and he begins with his plans at the funeral. One thing I liked about this story was how it was told through the first person point-of-view of more than one person. The majority of the story is relayed via Gin, but we also get into the head of Jonah McAllister and Phillip Kincaid, a man I believe who will play a big part in what is to come. It is an effective way to give the reader a big picture view of the world. As someone who is new to the series, I felt like Thread of Death was one of those mid-season recap TV shows – you know the ones where they toss in a bunch of old clips to try and bring the viewer up to speed and prepare for what is to come. And as such, Ms. Estep is extremely successful. I feel like I can tackle the upcoming story with little question about back story. I may be missing out on some emotional investment, but I feel after reading this story, I can move forward.